I had made ricotta cheese at home for making the Spinach Ricotta Raviolis and I had some left after making the raviolis. 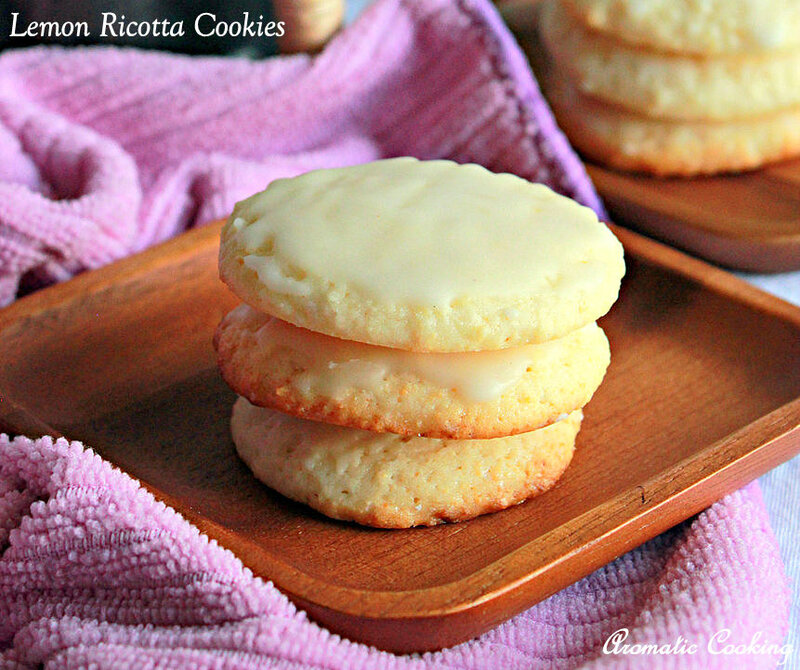 I wanted to use it in something within the next few days and I was not ready to make another pasta dish, so while browsing I found these Lemon Ricotta Cookies. There are so many recipes out there, but I followed this one from Food Network, the recipe is from Giada De Laurentiis, when I was in the US, I used to watch her shows regularly. Lemon and ricotta is a beautiful combination, and I made the cookies without eggs, replaced the eggs with corn starch and water. 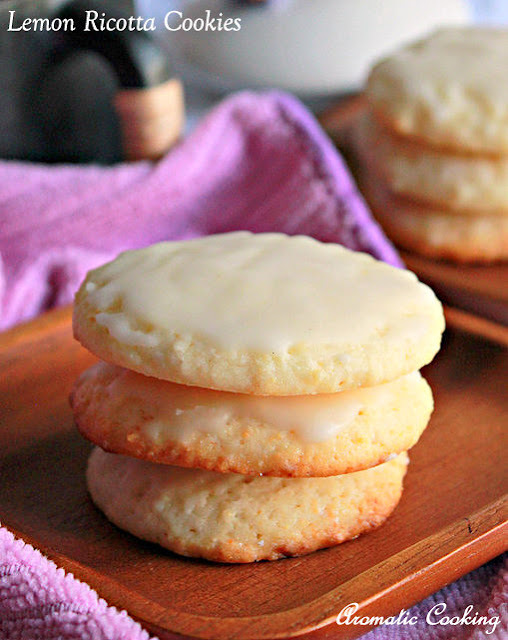 These cookies have a soft texture and they taste delicious with the beautiful lemon glaze on the top.. Melt the butter and mix in the sugar, the sugar granules were really big, so I added a tablespoon of water and warmed it in the microwave, so as to mix the sugar well. Now mix the corn starch in 1 tablespoon of water and add it to the sugar and butter mixture and mix it. Then add the ricotta cheese, lemon juice salt and lemon zest and mix it. Sift together the flour and baking powder and add it to the wet cheese mixture and mix it. Line a baking tray with parchment paper and spoon out the cookie dough, leaving a little space in between, the cookies would expand a little while baking. Bake it at 180 C for 20 - 23 minutes, till the edges start turning golden. Leave it to cool for about 20 minutes. Mix together the glaze ingredients and apply it on top of the cookies and let it cool completely, till the glaze hardens, like for about 2 hours. In the original recipe, the cookies were baked for only 15 minutes, but I baked it a little longer, still, the cookies were very soft. You can add zest of one lemon to the glaze also, I didn't have it, so I left it out, also the original recipe had used double the amount of sugar in the glaze, but I felt that this was enough. WOW! Amazing clicks. cookies look super delicious! These cookies look terrific, Hema. Lovely cookies, looks delicious and tempting..
Yummy cookies! love the glazing!! This recipe looks and sounds nice, i can imagine the taste with lemon flavour. These cookies looks and sounds nice, how did you make ricotta cheese at home.